Question 3: What was meant by “Christ”? Is it a title? Is it part of Jesus’ name? The Greek christos is used to translate “anointed” or “Messiah.” It might have made sense to a Greek audience. But it would be hampered by its first century usage to refer to wrestlers who had “greased up” before their match to make it more difficult for their opponents to gain a tactical hold on them during the match. The uses of “Messiah” or “anointed (one)” in the OT do not help much in understanding Jesus as Messiah. John’s message is telescoped to focus upon a single theme, the proclamation of a person still to come who will baptize the people with the Holy Spirit. As seen in the Notes, it is not clear what Mark means by this expression, nor is it clear that John understands the vey messianic terms he uses – at least in their fullness. In referring to this new Baptizer, whose dignity overshadowed his own, John avoided traditional messianic terms. The precise identity of the Coming One remained hidden, apparently, even from John. “To come after someone” is technical terminology for discipleship among the scribes and rabbis of the first century, and this usage is reflected in Jesus’ summons to men to come, or follow after him (cf. Ch. 1:17). It is possible, therefore, that John is saying, “He who is coming is a follower of mine.” Yet he affirms that he is not worthy of performing the most menial task, from which even the Hebrew slave was released, the removal of the master’s sandals. In no stronger manner could the mystery and the dignity of the Coming One be emphasized. The reference to the bestowal of the Spirit is appropriate to the wilderness context of John’s proclamation. Isaiah describes Israel’s trek in the wilderness as a march under the guidance of the Spirit of God (Isa. 63:11); it was the Spirit who gave the people rest in the wilderness (Isa. 63:14). As the first exodus had been a going forth into the wilderness under the leadership of God’s Spirit, the prophet announces the second exodus as a time when there will be a fresh outpouring of the Spirit (Isa. 32:15; 44:3). With this concept in mind John calls the people to the wilderness in anticipation of the fulfillment of the prophetic promise. It is this note of anticipation which Mark emphasizes by reducing John’s message to two statements, both of which point forward to something to come. They affirm that John is the forerunner of the Messiah (Ch. 1:7) and that his baptism is a preparation for the messianic baptism to come (Ch. 1:8). By introducing his Gospel with an account of the ministry of John, the evangelist re-creates for his own contemporaries the crisis of decision with which John had confronted all Israel. It is not enough to know who John was, historically. What is required is an encounter, through the medium of history, with that summons to judgment and repentance which John issued. Because the church recognized John’s role in redemptive history as the pioneer of the kingdom of God, it accorded him a prominent place in the Gospel tradition. It refused to allow his memory to slip uninterpreted into the past, but made his witness a part of the continuing Christian proclamation. John was the first preacher of the good news concerning Jesus. Mark 1:6 clothed…: The reference to John’s clothing and diet serves to emphasize that he is a man of the wilderness. Both his garb and his food are those familiar to the wilderness nomad, and characterize life in the desert. The reference to the leather girdle about the Baptist’s waist recalls a characteristic feature of another man of the wilderness, the prophet Elijah (2 Kings 1:8). The explicit identification of John with Elijah, however, is not made until Ch. 9:9–13. Mark 1:7 untie the straps of his sandals. An important cultural detail; in later Judaism, untying the thong of someone’s sandal was considered too menial a task for a Jewish slave to perform (Mekilta Exodus 21.2; b. Ketubbot 96a). If such an understanding goes back to John’s time, then John was saying that the One to come is so great that John is not worthy even to perform the most menial of tasks for him. Thus, by comparison he is less than a slave. This kind of humility appears in John’s Gospel (John 3:27–30). Mark 1:8 he will baptize you with the Holy Spirit. This allusion to baptism is associated with the arrival of the eschaton in the OT (Isa 35:15; 44:3; Ezek 11:19; 36:26–27; 37:14; Joel 2:28–29 [3:1–2]). God’s decisive act on behalf of humanity was announced as approaching in the baptizing ministry of the Messiah. This is why cleansing (water baptism) and repentance (what that cleansing represents) were part of John’s ministry of preparation (1:4). Participation in John’s baptism showed a readiness to receive the greater baptism that the coming One would bring. Preparation for forgiveness of sins leads to forgiveness when the greater One to whom John pointed is embraced. In OT thinking, when someone is cleansed and forgiven, God can indwell that person with the presence of his Spirit (Ezek 36:25–27). This summarizes Mark’s gospel: cleansing, forgiveness, and the intimate divine presence all come through the Messiah to those who, in faith, embrace repentance and reorientation in their lives. We should be a bit cautious here and not impose a range of meanings upon Mark’s use of the Greek word baptizo which means “to wash” — usually by dipping or immersing in water. Note its use in Mark 7:4. Symbolically, it can mean: “ritual purification,” “immersion”. What meaning(s) are implied by the phrase “He will baptize in the Holy Spirit”? How is that the similar or different from John’s baptism in water? I can’t find that Jesus ever baptized in the Holy Spirit in the gospel of Mark. The word pneuma (“spirit”) occurs 23 times. Jesus’ being driven into the wilderness to be tempted (1:12). Eleven times it is used with “unclean”. Three more times, “unclean” or “evil” is implied. The “spiritual” theme in Mark centers more on the unclean ones – who often recognize Jesus and whom Jesus is able to cast out. Perhaps the “baptism in the Holy Spirit” refers to the tempting persecution and suffering that the disciples would go through (13:9-13). 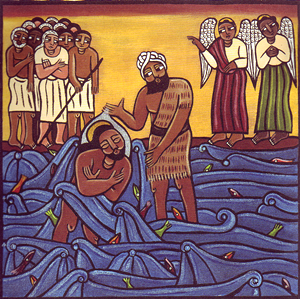 Jesus uses “baptism” in reference to his suffering and death and indicates that at least James and John will undergo the same type of baptism (10:38-39). There is no evidence in Mark that he understands “baptism in the Holy Spirit” in the manner assumed by Charismatics and Pentecostals.